The well known Wild goose (Anser anser Linnaeus 1758) is an aquatic bird belonging to the order of the Anseriforms (Anseriformes), to the family of the Anatids (Anatidae), to the subfamily of the Anserins (Anserinae) to the genus Anser and to the species Anser anser. The species includes two subspecies: the Western wild goose (Anser anser anser Linnaeus 1758) and the Eastern wild goose (Anser anser rubrirostris Swinhoe 1871). An alleged “coastal” subspecies, the (Anser anser sylvestris Brehm 1831). The name of the genus and of the species “anser” comes from the Latin and simply means goose. This goose, called also graylag or graylag goose, is famous for having been subject of studies done by the great naturalist and father of the ethology Konrad Lorenz who, by studying the newborns of wild goose discovered, studied and defined the phenomenon of the imprinting. And too << Even stone hearted would be touched in seeing the tiny grey goose getting closer to me whimpering, waving and stumbling, but with a determination that left no room for doubt: I, and not the white goose, was for her the mother! Sighing, I picked up my cross and carried it home; although by that time it weighed just 100 grams, I perfectly did know how much it would have grown, and how much work and effort it would cost me to raise it properly; resigned myself, and, just for a start, I solemnly baptized it with the name of Martina >>. It is a species with Euro-Asian distribution. The nominal subspecies is distributed in western and north-western Europe. The oriental species is present in eastern, south-eastern Europe and in Asia. Although the various populations may be considered usually as distinct, there is a genetic exchange between the two forms and therefore the geographical variations show a clinal trend from West to East. The subspecies sylvestris should have remained at the wild status only in Iceland, Scotland and Norway. The species nests locally in Iceland, northern and eastern Europe, central Asia. The northern populations migrate southwards in the Mediterranean basin and in southern Asia. For instance, the population of northern Europe moves mainly to Spain, in the area of the “Marismas”, whilst the central-European one (who crosses Italy) goes up to North Africa, where it frequents the coastal brackish lakes of Tunisia and of Algeria. In Spain as well as in Africa the main source of nourishment is formed, n the semi-submerged prairies, by the rhizomes ofScirpus maritimus. In Italy, the nominal subspecies is of double passage and wintry, but scarce. It arrives from late October to November, or even later and starts again in March. Fairly rare, a little more present in Tuscany, Venetia, Friuli-Venezia Giulia. The habitat of the zones of reproduction is formed by more or less high plains and steppes where the species prefers the humid zones of fresh water, not deep and tendentially eutrophic, with rich wetland vegetation (Phragmites). It nests, sometimes, also in more or less bushy areas, islets in estuaries and brackish areas, swamps, lakes, along rocky reefs or in the moors. During the other periods of the year and during the migration, it frequents and lives in swamps, humid or flooded plains, lagoons, stubbles, fields and meadows, banks of lakes, rivers, ponds and marine coasts. 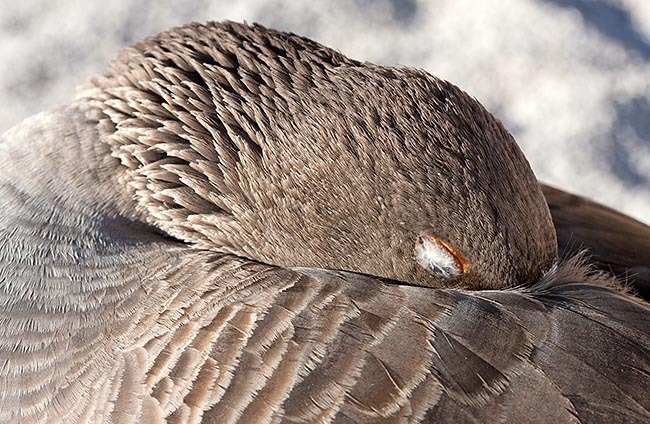 The elements that seem to conditionate more the distribution of the wild goose are the tranquillity (locations protected from the presence of predators and of the man) and the availability of food. It is possible that in the past the species was more diffused, as nesting, in many swamps which were, later on, dried up. In Italy it has been sometimes reintroduced in brackish valley areas where it finds protection and nests among the salt marshes vegetation (Juncus maritimus, Salicornia) and sheltered of great bramble bushes (Rubus fruticosus) and where it gets food in adjacent meadow areas. If these conditions are congenial, the reintroduced birds become resident. The value of the wild goose for the natural management of the swampy ecosystems is positive and important for the fact that the presence of this species may favour the vegetal and consequently zoological diversification. 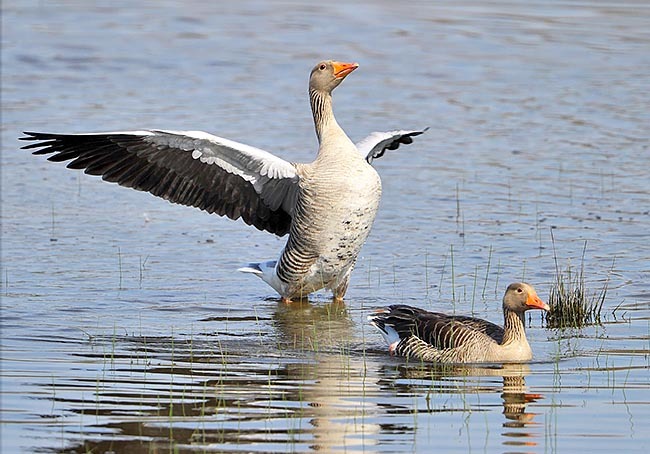 The wild goose is good-sized with a total length of 750-900 mm, a wingspan of 149-168 cm and a weight of 3000-3500 g.
It has stumpy and heavy forms but has a long neck. 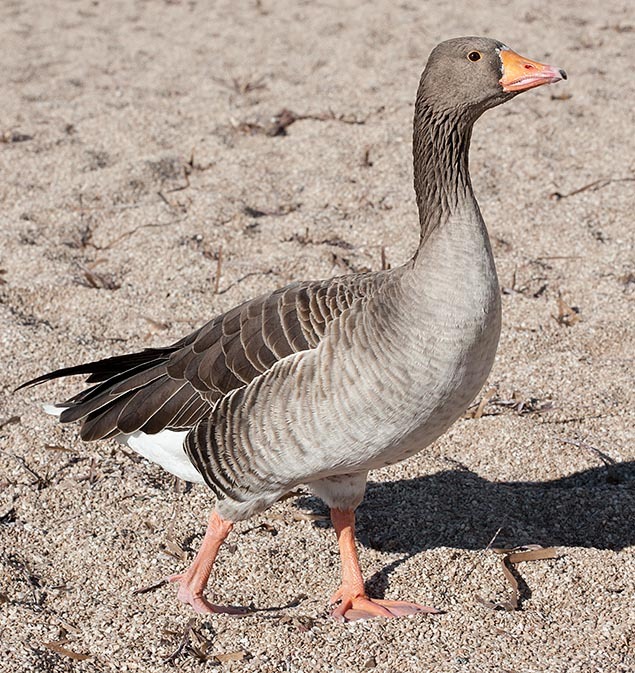 This goose has a predominant brown-greyish colouration with white parts: the head and the neck are grey-brownish with the narrow and little elongated neck feathers which give to the neck a crossed-knurled-lined look with the formation of slight lines-small grooves in low relief; a thin white line is often present at the base of the front-beak which may extend to the two sides and can be very visible to totally absent. The head, laterally excepting small white spots under the eye, the chin and the throat are pale grey-brown; the distal throat is paler. The chest and the abdomen are pale grey; the sides are grey-brownish with the feathers having brown-whitish apices. The abdomen and the undertail are white, at times with blackish spots. There are few dark transversal spots on the abdomen. The upper parts are brown with grey-bluish nuances and the margins of the feathers are ochraceous white to form a series of pale transversal bands; dark scapulars white terminated, part of the wing coverts are of brown-ash colour. The medial and cubital feathers are grey-brown bordered by whitish or pale greyish colour. The small coverts are pale gray. The rump is more brownish-whitish. The sides of the back and the upper coverts of the tail are white. The tail is short (128-151 mm), roundish, with 18, exceptionally 20, rectrices. The rectrices are dark brown ashy with white apices and margins; the outer ones are mostly white. The wings are long and pointed: the first primary remix is narrow and pointed; the third one is the longest and is emarginated on both barbs, the fourth is just a little shorter and emarginated on the outer barb, the second is emarginated on the inner barb. Grey primary fight feathers on the outer barb, the secondary are mainly brown-blackish. The coverts are pale grey-whitish. The wing of the male is 446-482 mm long, the female’s one is 416-468 mm long. The beak is high at the base and has about the same length as the head; the margin of the upper rhamphotheca is concave, jagged with 21-22 denticles visible from outside. On the tip of the beak is a convex nail occupying the whole apex. The nostrils are longitudinal and placed at about half of the beak which is of orange colour with narrow fleshy striae behind the nail, along the margins of the rhamphothecas and around the nostrils; the nail is ivory-horn coloured. The eyes have brown iris with coralline or fleshy eyelids. It has strong legs, centred under the body in way to facilitate the deambulation, the colour is orange-fleshy with black nails. The young is similar to the adult, without the while line at the base of the front, often whitish chin, mantle and scapulars more adorned of brown; sides of the body and hips pale brown-ashy, feathers of the neck rounded and not pointed. The oriental subspecies (Anser anser rubrirostris) is slightly bigger and paler than the nominal one. Its clear margins of the feathers are wider. The legs, the feet, the beak and the circle of periocular skin are of bright pink colour instead of orange. Furthermore, the beak is longer and less squat (less high at the base). The wild goose nourishes of herbaceous plants, aquatic plants, buds, seeds, grains and tubers. It collects the food on the soil but also in water. It is a bird having decided terrestrial habits and lover of open spaces; it is a major grazer. The robust beak allows utilizing also leaves and stems difficult to be used by other species of geese. In principle, the spring and summer feeding concerns the vegetative apices and the most tender parts (including possible fruits) of the plants, the autumn-winter one the underground parts (rhizomes, tubers). It nourishes during the day, flying early in the morning or by nightfall. If necessary, it can run and is a good swimmer. It is a rather shy and wary; one or more sentries are always present watching the flock and shelters in little frequented locations during the night and during the moult, when it loses the capacity of flying. The presence of flocks of wild geese can modify the habitat favouring, for instance, the growth of aquatic plants (Potamogeton pectinatus) loved by other species of birds caused by the reduction of reed surfaces, due to the grazing, and contributing in keeping free the water surfaces. The species can benefit from the deforestations done by the man in the plain and from the consequent greater diffusion of cultivated areas or grazed, congenial to these birds. To take flight, it rises vertically, quite easily, from the ground, less easily from the water. It has a straight flight, fast with wing beats. The V flight formations, or wavy lines, are guided by experienced adult specimens. It nests in moors, peatlands, and islets in flooded plains, among low bushes and reed or on banks of floating vegetation. In the pairs, territorial, the choice of the partner takes place precociously and the links between partners are often strengthened by the ceremony called of the “triumph ceremony” and which consists in an attack with stiff neck towards a real or fictitious danger with following return towards the true or potential partner always with stiff neck but with reciprocal displacement of the head outwards and the contemporary emission of noisy calls; in the same time there is the enlargement and the flapping of the wings. Behavioural links form also among subjects differing from the pair through ritualized signals of redirected aggressiveness. The link may last all the life long but there are exceptions to this rule. The nest is built with twigs, herbs and other vegetal material and is lined with feathers and down. Usually, 4-6 eggs (2-8) are spawned per annual hatching and they are incubated for about 28-30 days. If the brooding is lost, a second replacement spawning may take place. The egg of the wild goose has classical oval shape, is white-cream and may get shades of yellowish of pale brown during the hatching. Its average size is of 86 per 58 mm (77-94 per 49-60 mm) and the average weight of the shell is of 20 g. The nests of the various pairs are spaced each other of at least 5-6 metres due to the territorial behaviour of the species. The chicks are nidifugous and are able to fly when about 8 weeks old. The chick has front, sides of the face, neck and lower parts of yellow-greenish colour; vertex, nape, upper parts, sides of the body and thighs brown-olive with yellowish bar on the wings. The mothers take care of the young; the father defends the family from the conspecifics and from possible predators. In the young, the beak is initially grey-greenish with black nail, and then becomes yellow-greenish. The legs and the feet are of fleshy colour in the newborns and greyish in the young, the nails are of horn colour. The eyelids, in the young, are white-yellowish. Excepting the reproduction period, it carries on a gregarious life. It emits a huge variety of vocalizations; a prolonged cry “gangganggang” is used for keeping in touch the individuals of the same flock. The alarm is signalled with an analogous call but reduced almost to one syllable only. Are known also “puffs” produced particularly in attitude of defence. The cries are similar to those emitted by the domestic goose. 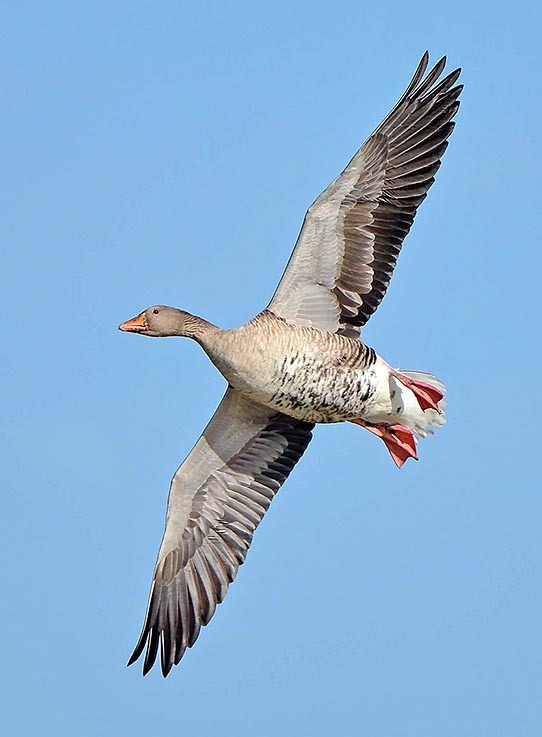 The wild goose effects one complete post-reproductive moult: the flight feathers and the wing coverts are lost at the same time and the bird is unable to fly for about one month in the period May-August. The non reproducers moult before the reproducers; these ones will resume flying when their young will learn to fly. The rest of the body moults once the flight feathers have grown up again. 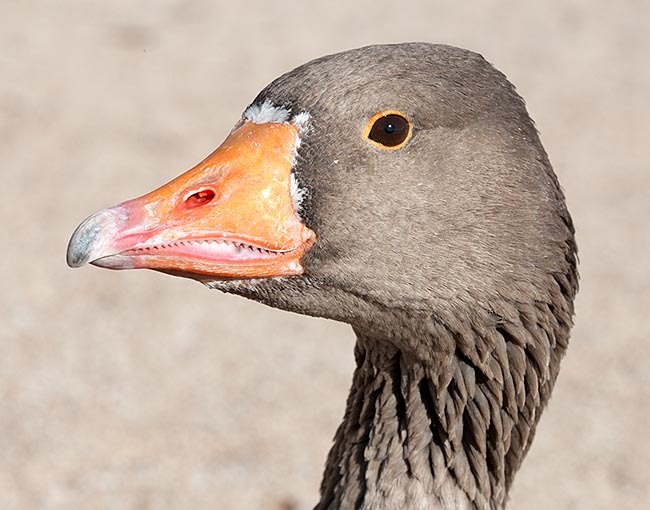 The wild goose (the western subspecies) along with the swan goose (Anser cygnoides) have originated the innumerable races of bred domestic goose. The domestication of the wild geese by the man goes back to very old times (it is already cited by Homer and appears also in the Egyptians frescoes) and already at the time of the Roman expeditions, the domestic goose was bred in almost all the European regions, in particular in the Germanic ones. This thanks to the natural predisposition to domestication and reproduction in captivity. For centuries, and still now, most of the domestic geese have been selected in order to be robust grazing specimens, with high productive capacities; once they did populate all the farms whilst nowadays breeding has been reduced. From their breeding we obtain: excellent flesh, morbid down and feathers, eggs. There are many and various domestic races perfectly inter-fecund, also with the domestic derivates of the swan goose (Anser cygnoides), Asian species with which inter-fecundity do exist. The oldest races keep colourations similar to the ancestral one but then, later on, have added various forms selected from albino, albinotic or leucistic subjects. 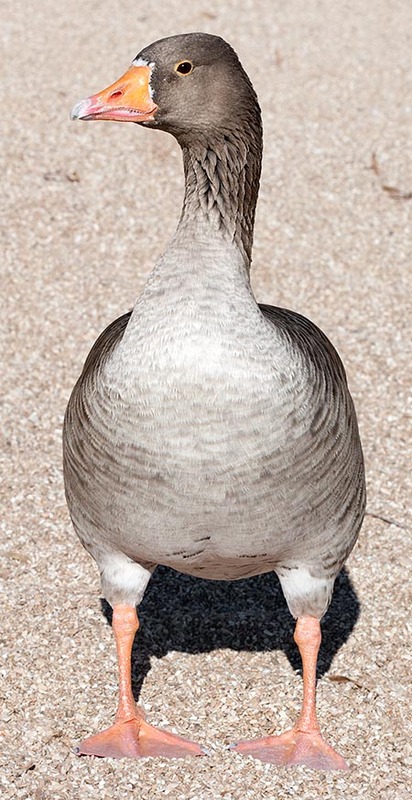 The frankly domestic geese, besides being usually big, heavy and inept to the flight, have normally a squat and very high at the base beak, prominent abdomen, high and protruding chest, non horizontal axis of the body. 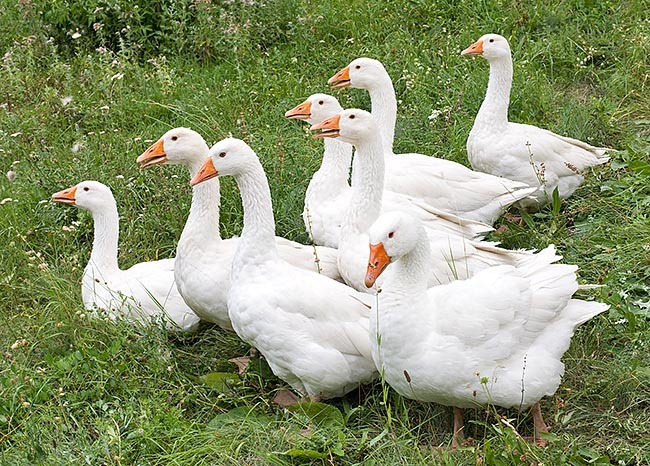 Among the most known and prized domestic races stand the white Emden geese, incredibly high animals whose weight oscillates between the 10 and the 12 kg; the Toulouse geese which are slightly less heavy, and which have been selected for having a developed liver that is utilized as prized ingredient in the French cuisine: the females of both races can spawn 30 to 50 and more eggs which, however, hardly they hatch. On the contrary, other domestic races such as the Pomeranian geese and the Alsatian geese, whose weight oscillates between the 5 and 7 kg, hatch the eggs and care the chicks without any problem. Another very peculiar goose is the Danubian or Curl goose, characterized by the long curled feathers, especially in the region of the shoulders, the fore part of the back, and, in a reduced way, also on the wings; very short are, on the contrary, the flight and remiges feathers. Some geese may have been selected, for ornamental purposes, for getting tufts of feathers on the head. This characteristic as well as the several colourations of the livery, which presents an extraordinary variety of nuances, disposition of the colour and sizes, may be present in different recognized races or local bred domestic populations. The American Pilgrim goose is auto-sexing thanks to the different colouration of the livery in the two sexes: the males, in fact, are white whilst the adult females have the head and the neck white and the rest of the body pale grey. In Italy were bred many races of domestic goose and unfortunately many of them are extinct. Amongst the present ones we mention the Roman tufted goose, totally white, famous in the past fro the high fecundity and whose newborn chicks are auto-sexing: uniform yellow canary colour for the males and with darker summit of the head the females. Other Italian race, famous for the excellence of the flesh, is the Venetian spotted goose. This race is characterized for having, as the name says, white livery with grey spots on the head, sides, back and tail.